I hope your week is going great~the LONG weekend is almost here~woot woot!!! Do you have any exciting plans? Fireworks (Forth of July for USA)? Crafting? Of course I have my list started, and as usual it is a little unrealistic...but, since I am a list maker I like to write down all the things I would like to accomplish so I don't forget *wink* I even added a few things for my hubby (which I am sure he will appreciate, LOL!). Mike and I are getting ready to go through this program at our church in the fall (which I am pretty excited to start...I think)~so we decided that instead of going away for a few days~we would save some $$ and have a stay~cation (maybe a day trip), which is fine with me, since I really do like being at home (I am such a home~body). I may even do some digi scrapping, which I have not done in ages!!! I pulled out my cuttlebug and went to town with my die's for this card (I just love my Cuttlebug!!). And for the color scheme I used this list from PTI, I used Nichole's suggested colors (except I left out Summer Sunrise and added Dark Chocolate and Kraft). 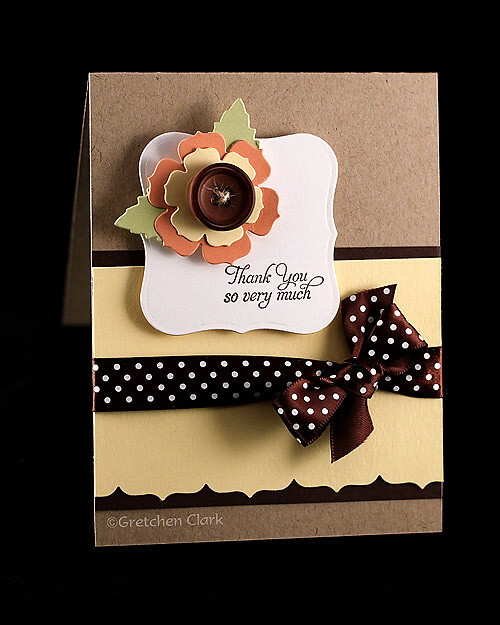 This is a beautiful card Gretchen! And thanks to your enabling, I put in an order at PTI including this gorgeous flower die set. Can't wait to get it (hopefully early next week!). are you ready for a pedi?? ?